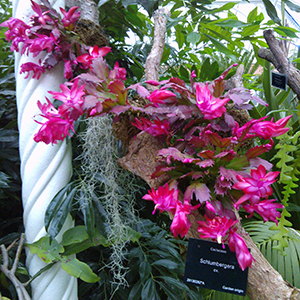 Home » Plants of the Month: December » Christmas Cacti Schlumbergera sp. These long lived house plants are well known to all. However what is seldom known is that they are not terrestrial plants that grow in the ground, but are epiphytes; plants growing on tree branches for support. These rainforest cacti are unlike desert cacti, in that they grow in seasonally dry, humid rainforests and can tolerate more shade. See ours in flower, growing on tree branches in the Subtropical House now.